Mo Willems writes wonderfully quirky beginner reader books and his Cat the Cat, Who Is That? is one of them. Willems also has a talent for drawing in a simple way that young kids can easily duplicate. I ran across this video earlier in the week (via @HarperChildrens) and knew my daughter would love it. A drawing lesson from Willems and he uses letters and numbers to teach his technique - how cool is that? 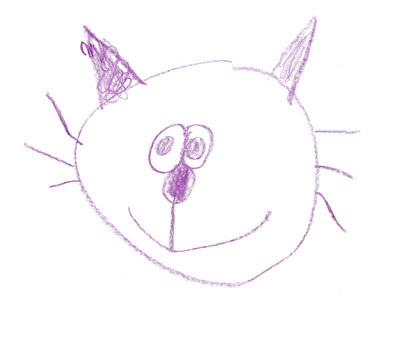 She grabbed her purple crayon, followed the fun directions and created her own version of Cat the Cat. Of course she had to add her own personal touch - purple ears. The upside-down V's obviously weren't colorful enough for her taste. This is her first attempt. She watched the video several more times, drawing a girl cat, a boy cat and a cat with weird eyes among others. I think she has Cat the Cat down pat. Show this short video to your favorite young person. I guarantee they'll want to grab the nearest drawing instrument and try drawing the Cat!